One of the most colourful figures in Scottish history, Bothwell was educated by his grand-uncle, Bishop Hepburn of Moray and he succeeded his father as earl of Bothwell and hereditary lord high admiral of Scotland in 1556 at the age of 21. His fiery temper and jealousy of the Earl of Murray involved him in a succession of riots and brawls which led him (on more than one occasion) to imprisonment and exile. Although he professed adherence to the reformed religion, he supported the government of the regent, the French Catholic Mary of Guise (widow of King James V and mother of Mary Queen of Scots). Mary of Guise employed him as an ambassador in France. During a visit to Copenhagen in 1560 he met Anna Christophersdatter Trond Rustung and became engaged to her. He was given a huge dowry of 40,000 Talar by her father, the Norwegian Christopher Trond Rustung (Admiral of the Danish King). He left with her to return to Scotland, but then left her in Holland. That might have been the end of the affair, but eventually it was to be his undoing. In 1565 Mary Queen of Scots, then married to Lord Darnley, recalled him from France, and in 1566 Bothwell married Jean Gordon, sister of the earl of Huntly. Mary relied greatly on Bothwell's advice though there are suggestions that there was a romantic involvement as well. Darnley was a worthless, arrogant man who alienated many of the Scottish nobles. He was also a member of the group which murdered David Rizzio, Mary's secretary, in Holyrood Palace in 1566, in the presence of Mary. The future James VI was born a few months later. Bothwell played no part in the murder of the Queen's musician and favourite, David Rizzio, in the Palace of Holyroodhouse. However, he was a major player in the plot against the Queen's husband, Lord Darnley who was murdered in 1567. But he was acquitted after a trial in which the chief prosecutor, Lennox, dared not attend. 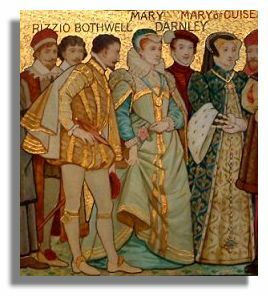 In April, 1567, Bothwell seized and carried off the queen to Dunbar, and on 15 May, after he had divorced his wife, they were married at Holyrood on 15 May 1567. Bothwell was made duke of Orkney and Shetland by the queen. 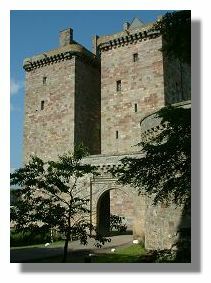 Mary and Bothwell moved to Borthwick Castle (pictured here) for safety. Many of the Scottish nobles rose up in revolt and the rival forces met at Carberry Hill on 15 June 1567. Bothwell's forces dispersed without a struggle and the nobles converged on Borthwick Castle. If Mary had disowned Bothwell she could still have survived as sovereign but she refused. Mary was imprisoned in Loch Leven Castle but later escaped in May 1568 but was defeated at the Battle of Langside on 13 May. Bothwell escaped and tried to rally support but he was forced to flee to Scandinavia. He was captured in September 1567 near the Norwegian coast - and his jilting of the Danish woman Anna Rustung and departing with the dowry came home to roost. Anna pursued the case, demanding a high monthy pension, prolonging his stay in the "Bergenhus" and resulting in his permanent imprisonment (later in Malmö and Dragholm). Bothwell spent the next ten years in prison and perhaps understandably, he lost his mind before his death on April 14, 1578.